Upon learning that Senator John McCain had chosen Alaska Governor Sarah Palin for his vice-president my immediate thoughts were: 1) oil, 2) the New York Times photograph of a polar bear swimming in the Chukchi Sea, apparently heading towards the nearest ice some 400 miles away, and 3) what choosing Governor Palin says about a McCain administration's energy, environmental and science policies. The news media has immediately focused on Governor Palin's personableness, her experience, strong "pro-life" position, NRA membership, and efforts to reform Alaska's government corruption. Here are some other notes to consider: With Arctic Sea ice at its lowest point since measurements began - scientists assessing Arctic conditions say what's happening indicates we're moving past the point of no return - under Governor Palin the State of Alaska filed suit against the Department of the Interior to stop the Endangered Species Act listing of polar bears. Alaskans don't need other places telling us what to do, says Palin. Although she's fished commercially, she supports the Pebble Mine - what would be North America's largest open pit copper and gold mine - that would threaten Bristol Bay's wild sockeye salmon run, the largest in the world. Palin established a sub-cabinet committee on climate change but doesn't believe global warming is caused by humans. She strongly favors oil and gas drilling in the Alaska National Wildlife Refuge and has called the area under consideration "flat and barren." Those opposed to drilling in ANWR (a group that would include former President Jimmy Carter), she labeled "extremists." A Wall Street Journal column called her "penchant" for increased oil and gas exploration "even bigger than John McCain's." And in July, Palin told Investor's Business Daily, "I beg to disagree with any candidate who would say we can't drill our way out of our problem...." Palin is eager to see to see oil extraction in the Chukchi and Beaufort Seas - areas now literally on the front lines of climate change. She's been praised for standing up to big oil companies. What this entails, however, is negotiating better deals for Alaska, a state whose economy depends on oil revenue. Palin voices respect for animals but opposed a bill that would ban aerial hunting of wolves - a practice authorized under her administration's predator control policy, which includes killing of grizzly and black bear mothers and cubs, and bear-baiting - previously not allowed in Alaska. In September 2007, dozens of scientists signed a letter to Palin, protesting these practices and urging her to re-examine the biological and ecological basis of Alaska's predator control programs. As for science in a McCain administration, if his VP has a say as she did during her gubernatorial campaign, it would support teaching creationism alongside of evolution. There are hard questions about energy and environment to be asked of Obama and Biden but Biden's League of Conservation Voters ratings ranged from 88 to 96% until missed votes lowered his 2007 score to 67%. McCain's average score is just shy of 28%. It was 0 in 2007 when he missed every environmental vote - including bills to increase energy efficiency and consider global warming's impact on water resources (all bills Biden and Obama voted for). Meanwhile Obama's first term rated 96% and like Biden dropped to 67% due to missed votes last year. 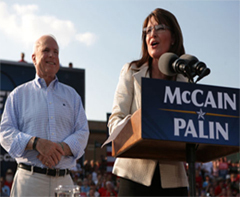 Governor Palin may bring fresh personal energy to the McCain ticket and she clearly relishes time in the great outdoors, but her record does not signal a fresh policy direction for Republicans on energy or the environment. What do you think? Leave us a comment. ———- Elizabeth Grossman is the author of High Tech Trash: Digital Devices, Hidden Toxics, and Human Health.